is an American adventurer and a political activist shown in this pre-1871 photograph wearing an Afghan robe. The first recorded contact between Afghanistan and the United States occurred in the 1830s when Josiah Harlan, an American adventurer and political activist from the Philadelphia area of Pennsylvania, traveled to the Indian subcontinent with intentions of becoming the King of Afghanistan. It was when the British Indian army invaded Afghanistan, during the First Anglo-Afghan War (1838–1842) when Afghan kings Shuja Shah Durrani and Dost Mohammad Khan were fighting for the throne of the Durrani Empire. Harlan became involved in Afghan politics and factional military actions, eventually winning the title Prince of Ghor in exchange for military aid. The British-Indian forces were defeated and forced to make a complete withdrawal a few years later, with around 16,500 of them being reported to be killed and captured in 1842. There is no clear evidence as to what happened because the claim is made by William Brydon, the lone survivor. Harlan is believed to have left Afghanistan around the same period, eventually returning to the United States. In 1911, A.C. Jewett arrived in Afghanistan to build a hydroelectric plant near Kabul. He became the Chief Engineer for King Habibullah Khan. Formerly an employee of General Electric (GE), he became the second American known to live and work in Afghanistan. In January 1921, after the Treaty of Rawalpindi was signed between Afghanistan and colonial British India, the Afghan mission visited the United States to establish diplomatic relations. Upon their return to Kabul, the envoys brought a greeting letter from U.S. President Warren G. Harding. After the establishment of diplomatic relations, the US policy of helping developing nations raise their standard of living was an important factor in maintaining and improving US ties with Afghanistan. Residing in Tehran, William Harrison Hornibrook served as a non-resident US Envoy (Minister Plenipotentiary) to Afghanistan from 1935 to 1936. Louis Goethe Dreyfus served from 1940 to 1942, at which point the Kabul Legation was opened in June 1942. Major Gordon Enders of the United States Army was appointed the first military attaché to Kabul and Cornelius Van Hemert Engert represented the U.S. Legation from 1942 to 1945 followed by Ely Eliot Palmer from 1945 to 1948. Although Afghanistan had close relations with Nazi Germany, it remained neutral and was not a participant in World War II. Afghan-American relations became important during the start of the Cold War, between the United States and Soviet Union. Prince Mohammed Naim, King Zahir Shah's cousin, became the Chargé d'affaires in Washington, D.C. At that time, U.S. President Harry S. Truman commented that the friendship between the two countries would be "preserved and strengthened" by the presence of senior diplomats in each capital. The first official Afghanistan Ambassador to the United States was Habibullah Khan Tarzi, who served until 1953. The U.S. Kabul Legation was elevated to the U.S. Embassy Kabul on May 6, 1948. Louis Goethe Dreyfus, who previously served as Minister Plenipotentiary, became the U.S. Ambassador to Afghanistan from 1949 to 1951. The first American expedition to Afghanistan was led by Louis Dupree, Walter Fairservis, and Henry Hart. In 1953, Richard Nixon who was serving as U.S. Vice President at the time made an official diplomatic visit to Kabul. He also took a short tour around the city and met with local Afghans. U.S. President Dwight D. Eisenhower's state visit to Afghanistan on December 9, 1959. In 1958, Prime Minister Daoud Khan became the first Afghan to speak before the United States Congress in Washington, DC. His presentation focused on a number of issues, but most importantly, underscored the importance of US-Afghan relations. While in the US capital of Washington, Daoud met with President Dwight Eisenhower, signed an important cultural exchange agreement, and reaffirmed personal relations with Vice President Nixon that had begun during the latter's trip to Kabul in 1953. The Prime Minister also traveled around the United States visiting the New York Stock Exchange, the Empire State Building, hydroelectric facilities at the Tennessee Valley Authority (TVA), and other sites. King Zahir Shah of Afghanistan and U.S. President John F. Kennedy in Washington, D.C., two months before his assassination. At that time the United States declined Afghanistan's request for defense cooperation but extended an economic assistance program focused on the development of Afghanistan's physical infrastructure—roads, dams, and power plants. Later, US aid shifted from infrastructure projects to technical assistance programs to help develop the skills needed to build a modern economy. Contacts between the United States and Afghanistan increased during the 1950s, especially during the Cuban Revolution between 1953 and 1959. While the Soviet Union was supporting Cuba's Fidel Castro, the United States was focusing on Afghanistan for its strategic purposes. This was mainly to counter the spread of communism and the strength of the Soviet Union into South Asia, particularly the Persian Gulf. President Eisenhower made a state visit to Afghanistan in December 1959 to meet with its leaders. He landed at Bagram Airfield and then drove from there to Kabul in a motorcade. He met with King Zahir Shah, Prime Minister Daoud and a number of high-ranking government officials. He also took a tour of Kabul. After this important visit, the United States began to feel that Afghanistan was safe from ever becoming a Soviet satellite state. From the 1950s to 1979, U.S. foreign assistance provided Afghanistan with more than $500 million in loans, grants, and surplus agricultural commodities to develop transportation facilities, increase agricultural production, expand the educational system, stimulate industry, and improve government administration. In 1963, King Zahir Shah of Afghanistan made a special state visit to the United States where he was met by John F. Kennedy and Eunice Kennedy Shriver. Zahir Shah also took a special tour of the United States, visiting Disney Land in California, New York and other places. Habibullah Karzai, uncle of Hamid Karzai who served as representative of Afghanistan at the United Nations, is also believed to have accompanied Zahir Shah in the course of the King's state visit. During this period the Soviets were beginning to feel that the United States was turning Afghanistan into a satellite state. In 1965, Afghanistan and Cuba saw the establishment of communist parties, the Communist Party of Cuba and the People's Democratic Party of Afghanistan (PDPA). Vice President Spiro Agnew, accompanied by Apollo 10 astronauts Thomas Stafford and Eugene Cernan, visited Kabul during an eleven-nation tour of Asia. At a formal dinner hosted by the Royal Family, the American delegation presented the King with a piece of lunar rock, a small Afghan flag carried on the Apollo 11 flight to the moon, and photographs of Afghanistan taken from space. By the 1970s, numerous American teachers, engineers, doctors, scholars, diplomats, and explorers had traversed Afghanistan's rugged landscape where they lived and worked. The Peace Corps was active in Afghanistan between 1962 and 1979. Many other American programs were running in the country such as CARE, American Scouting overseas (Afghanistan Scout Association), USAID, and others. After the April 1978 Saur Revolution, relations between the two nations deteriorated. In February 1979, U.S. Ambassador Adolph "Spike" Dubs was murdered in Kabul after Afghan security forces burst in on his kidnappers. The U.S. then reduced bilateral assistance and terminated a small military training program. All remaining assistance agreements were ended after the Soviet invasion of Afghanistan. Following the Soviet invasion, the United States supported diplomatic efforts to achieve a Soviet withdrawal. In addition, generous U.S. contributions to the refugee program in Pakistan played a major part in efforts to assist Afghan refugees. U.S. efforts also included helping the population living inside Afghanistan. This cross-border humanitarian assistance program aimed at increasing Afghan self-sufficiency and helping resist Soviet attempts to drive civilians out of the rebel-dominated countryside. During the period of Soviet occupation of Afghanistan, the U.S. provided about 3 billion US dollars in military and economic assistance to the Mujahideen groups stationed on the Pakistani side of the Durand Line. The U.S. Embassy in Kabul was closed in January 1989 for security reasons. The United States welcomed the new Islamic administration that came to power in April 1992 after the fall of the former Soviet-backed government. After this, the Mujahideen groups that won started a civil war amongst themselves, but the United States's attention was away from Afghanistan at the time. 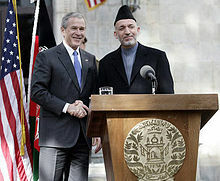 Former U.S. President George W. Bush with Afghan President Hamid Karzai in Kabul, Afghanistan, on March 1, 2006. Following the September 11 attacks in the United States, believed to be orchestrated by Osama bin Laden who was residing in Afghanistan under asylum at the time, the U.S.-led Operation Enduring Freedom was launched. This major military operation was aimed at removing the Taliban government from power and to capture or kill al Qaeda members, including Osama bin Laden. Following the overthrow of the Taliban, the U.S. supported the new government of Afghan President Hamid Karzai by maintaining a high level of troops to establish the authority of his government as well as combat Taliban insurgency. Both Afghanistan and the United States resumed diplomatic ties in late 2001. The U.S. Embassy in Kabul, Afghanistan. There is also a U.S. consulate in the city of Herat in the west, with others being built in Mazar-e-Sharif in the north, Kandahar in the south, and Jalalabad in the east. Afghanistan embassy in Washington D.C., United States. The United States has taken the leading role in the overall reconstruction of Afghanistan by providing billions of dollars to the Afghan National Security Forces, building national roads, government and educational institutions. In 2005, the United States and Afghanistan signed a strategic partnership agreement committing both nations to a long-term relationship. On 1 March 2006, U.S. President George W. Bush along with his wife Laura made a visit to Afghanistan where they greeted US soldiers, met with Afghan officials and later appeared at a special inauguration ceremony at the U.S. Embassy. Although many American politicians have praised Afghan President Hamid Karzai's leadership, he has come under fire in 2009 from the Obama administration for his unwillingness to crack down on government corruption. After winning the 2009 presidential election Karzai vowed to tackle the problem. He stated that "individuals who are involved in corruption will have no place in the government." Karzai and U.S. President Barack Obama at the NATO summit in November 2010. The U.S. Embassy in Kabul began renovation in late 2001 and was expanded several years later. Many high level U.S. politicians, military personnels, celebrities and journalists began visiting Afghanistan over the last nine years. The U.S. State Department is currently spending another $500 million to further expand their embassy in Kabul, which is scheduled to be completed in 2014. In December 2009, U.S. Ambassador Karl Eikenberry and Afghan officials, after signing a land lease for the mission with Afghan Foreign Minister Rangin Spanta, announced that the United States will open consulates outside Kabul. A first lease-contract was signed in the northern city of Mazar-i-Sharif and a second one in the western city of Herat. The consulate in Herat will temporary operate for three years in a leased hotel. During the period the United States will construct a new building for the consulate there. The Herat and Mazar-i-Sharif consulates will begin functioning in mid-2011. Two more U.S. consulates are being planned for the southern and eastern zones in Afghanistan, one in Kandahar and another in Jalalabad. The Islamic Republic of Afghanistan has an embassy in Washington DC, as well as a consulate in New York City and another in Los Angeles. The current Afghan Ambassador to the United States is Hamdullah Mohib, replacing Eklil Ahmad Hakimi in early 2015. The United States Armed Forces have been gradually rising its troop level in Afghanistan since 2002, reaching about 100,000 in 2010. They are to begin leaving slowly between mid-2011 to the end of 2014. However, Vice President Joe Biden has proposed to station an unknown number of the U.S. military forces after 2014. South Carolina Senator Lindsey Graham also suggested that the United States should stay in Afghanistan permanently. He claims that this would benefit both nations, as the U.S. would have a clear idea about what was happening in the region on a daily basis, and Afghan security forces would have an edge militarily to ensure that the country never went back into the hands of the Taliban. He further claimed that Afghan leaders accept this long-term U.S. military presence since it benefits them, but neighboring Iran and some of its allies are opposed to it, though this claim is disputable. [neutrality is disputed] In January 2017, the U.S. decided to send 300 Marines to Afghanistan's Helmand province to assist Afghan security forces to battle Taliban insurgents in intelligence and logistics matters. On 2 May 2012, Afghan President Hamid Karzai and The United States President Barack Obama signed a strategic partnership agreement between the two countries, after the US president had arrived in Kabul as part of unannounced trip to Afghanistan on the first anniversary of Osama bin Laden's death. The U.S.-Afghanistan Strategic Partnership Agreement, officially entitled the "Enduring Strategic Partnership Agreement between the Islamic Republic of Afghanistan and the United States of America", provides the long-term framework for the relationship between Afghanistan and the United States of America after the drawdown of U.S. forces in the Afghanistan war. The Strategic Partnership Agreement went into effect on July 4, 2012 as stated by US Secretary of State Hillary Clinton who said on July 8, 2012 at the Tokyo Conference on Afghanistan: "Like a number of countries represented here, the United States and Afghanistan signed a Strategic Partnership Agreement that went into effect four days ago." On 7 July 2012, as part of the Enduring Strategic Partnership Agreement, the United States designated Afghanistan a major non-NATO ally after US Secretary of State Hillary Clinton arrived in Kabul to meet with President Karzai. She said, "There are a number of benefits that accrue to countries that have this designation... They are able to have access to excess defense supplies, for example, and they can be part of certain kinds of training and capacity building." Embassy of Afghanistan, Washington, D.C.
^ a b "Biography of Josia Harlan". Archived from the original on 2006-09-01. Retrieved 2007-07-19. ^ "BBC Poll: Attitudes towards Countries". Archived from the original on 18 January 2007. Retrieved 2 April 2016. ^ "In Small Things Remembered". Retrieved 2 April 2016. ^ a b c "U.S.-AFGHAN RELATIONS". United States Department of State. Retrieved 2011-10-13. ^ a b "About the Embassy". U.S. Embassy in Kabul. Archived from the original on 2011-10-15. Retrieved 2011-10-13. ^ "In Small Things Remembered » The first American expedition to Afghanistan". Retrieved 2 April 2016. ^ "In Small Things Remembered » President Dwight D. Eisenhower inspects the honor guard upon arrival at Bagram Airport". Retrieved 2 April 2016. ^ "THE AFGHAN RULERS: FIERCELY TRADITIONAL TRIBES". Jere Van Dyck, special to the New York Times; the following dispatch was written by freelance journalist who recently spent six weeks in Afghanistan. The New York Times. December 21, 1981. Retrieved 2011-01-13. ^ "U.S. To Spend $500 Million On Kabul Embassy". Radio Free Europe/Radio Liberty (RFE/RL). November 4, 2010. Archived from the original on 19 January 2011. Retrieved 2011-01-18. ^ "Transcripts and Remarks - Embassy of the United States Kabul, Afghanistan". Archived from the original on 26 February 2013. Retrieved 2 April 2016. ^ "Transcripts and Remarks - Embassy of the United States Kabul, Afghanistan". Archived from the original on 3 March 2016. Retrieved 2 April 2016. ^ "US to open consulates in more provinces". Retrieved 2 April 2016. ^ "Afghan-US Relations". Embassy of Afghanistan in Washington, D.C. Retrieved 2016-08-22. ^ "Senator wants Karzai to address corruption, U.S. to set up air base". Pajhwok Afghan News. January 3, 2011. Archived from the original on 2012-03-13. Retrieved 2011-01-18. ^ "US presence fueling insecurity in region: Iran". Pajhwok Afghan News. March 8, 2011. Retrieved 2011-03-08. ^ Smith, Josh (7 January 2017). "U.S. to send 300 Marines to Afghanistan's Helmand province". Reuters. Retrieved 9 January 2017. ^ Matthew Rosemberg and Graham Bowley (7 July 2012). "U.S. Grants Special Ally Status to Afghans, Easing Fears of Abandonment". The New York Times. Retrieved 8 July 2012. ^ Sweet, Lynn (1 May 2012). "U.S.-Afgan strategic agreement: Roadmap to Chicago NATO Summit. Briefing transcript". Chicago Sun-Times. Archived from the original on 7 May 2012. Retrieved 4 May 2012. ^ Clinton, Hillary (8 July 2012). "Press Releases: Intervention at the Tokyo Conference on Afghanistan". NewsRoomAmerica.com. Archived from the original on 2012-11-05. Retrieved 8 July 2012. Wikimedia Commons has media related to Relations of Afghanistan and the United States. Embassy of Afghanistan in Washington D.C.